If you love the hunting thrill, you like how the adrenaline rush gets to you when in big game hunting. This applies in particular when making clean shots at fast moving animals. But you can’t accomplish such accuracy just by the skills you acquire in hunting escapades. You’ll require an efficient scope and of course some luck. Luckily we’ve tracked down the best riflescope for deer hunting. When looking to acquire a deer hunting riflescope, many perks come into play. The search is made even harder with the many options on the market. They come in all price ranges and claim to perform exceptionally when on your rifle. This is until you get to try some units out and they turn out to be far from what you are looking for regarding the best deer hunting scope. We have identified the models that make the best picks among the vast hunting scopes market today. 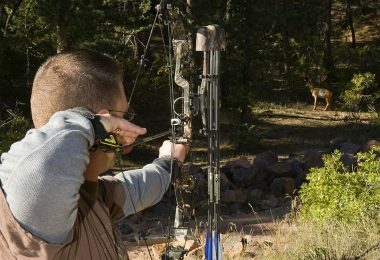 They all apply to deer hunting in that they cover all ranges from close to long range shooting. As much as you are confined to the first light and last light, you are deemed to find yourself in thick vegetation when visibility closes in. That’s why you can’t underrate the power of a bright scope. A brightly lit scope will help in improving your accuracy levels and the way you make correct range finding. Look at the size of the objective lens, more so if you expect to be in poorly lit surroundings. A big lens will keep the light transmission at a maximum. A reasonably sized objective should be up to 50mm if you expect to carry the scope without unwarranted weight addition. Looking at the size of deer, they are large animals so you may need to trim down on the power. This is mainly for the close range shooters. 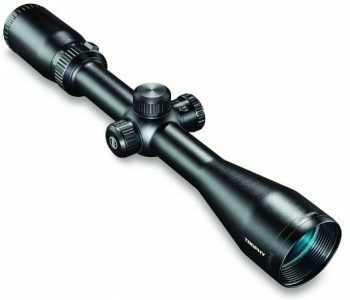 But if you are into long range hunting, you may want to look into scopes with over 10x magnification for ranging over 600 yards. The next decision to make about the zooming option is whether you want fixed or variable power. Fixed power works if your environment is extremely dangerous and you don’t want to be caught making power corrections when an animal is close enough. For versatile zoom style, they are viable in familiar surroundings. You’d love to work with a unit whose zeroed settings do not keep on changing. A robust body makes this possible by ensuring it is impact resistant. You will go through roughly beaten paths and the only way to make consistent shots is if the scope does not shift after these encounters and the slightest hint of recoil. A robust body is also fog, dust, debris and waterproofed. The way you know this is whether it has an O-ring seal for the dust and debris, nitrogen or argon filling for the fog and moisture prevention. These features prolong the life of your scope. A scope that costs top dollar may actually have the highest qualities required in a scope, but the question is whether it is all worth it. The truth is that scopes within the economical price ranges compete effectively with these models. An important note though if you are going for the inexpensive models is to watch out for the compromises you’ll be making. Look out for consistency, durability, and ability to maintain the sighting corrections. When you make multiple missed shots, something is most likely off. Most probably you have a parallax issue. You’ll notice this when you identify a fixed object shifts when you move your eye. Choose the scope which has the shortest parallax adjustment out to infinity, like from 10 or 30 yards to infinity. An adjustable objective lens is even better and more popular in hunting optics. It makes correcting for parallax fast because it keeps the crosshairs still. This is done by rotating the objective lens until the reticle is in line. This way you’ll have tamed your scope to make repeatable clean shots. 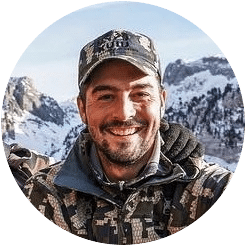 Now that we have gone over the important things to consider in a good scope for deer hunting, let’s take a look at some of the top rated options. Any of these would make great choices, but you’ll need to pick the one that best matches your needs. Description: The Nikon Prostaff Riflescope is made by a renowned manufacturer bearing necessary features to make hunting of the big game effortless. It is the best gear you can adorn when venturing into dangerous grounds where anything could happen. This scope gives you the chance to stay out of trouble as you’ll not be shooting too close to the animal. It bears the great BDC reticle to help compensate for the wind and elevation accurately. It also gives you great holdover for the long-range hunter. A good thing with the reticle is that it carries see through ballistics. You can aim out to distances over 500 yards, and aim fast at a moving target 30 yards out. For the windage and elevation adjustments, it provides for a zero-reset turret which keeps the zero at the required settings. You can engage with consistent accuracy over many shots. With the fast eye focus knob, adjusting for eye relief is smooth and speedy. The optical system explores multi-coated lenses efficient for 98% light gathering capacity. It makes for a good scope in low visibility areas, particularly through dark vegetation. With a magnification power varying between3x-9x, you’ll experience a full field of you, keeping you in line with acquiring correct range. It is also a lightweight but sturdy scope with a construction from aluminum. The black matte finish makes venturing without giving your position visible. The entire frame is nitrogen filled and O-ring for moisture prevention and fogging resistance. Related: This scope requires medium and high rings; that’s why we recommend the Nikon 1-inch Tube Medium Scope Rings. They keep the objective lens from rubbing against the rifle and mount on all standard Weaver and Picatinny rails. You can also invest in the Nikon P-Series Picatinny Mount for this particular riflescope. It has an aluminum construction to afford proper balance for correct clearance in making quick adjustments like eye relief. 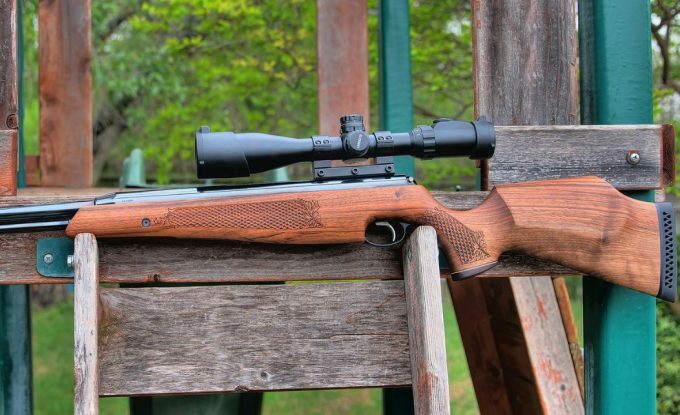 Description: The Simmons Truplex Reticle 8-Point Riflescope could not have come at a better time than when you are out in the woods. It offers bright optics, complemented by a 50mm objective lens. It ensures maximum light gathering to give the most colorful view, which helps in identifying images with high contrast. It also carries fully multicoated lenses to absorb as much light as possible, preventing reflection. With a black coating, this scope can easily mask your position by preventing glare against its surface. With this unit, you get a variable magnification between 3x-9x. This zoom gives clear and sharp images at all levels even the highest. The resolution is high such that even in dark backgrounds, you can pick out figures that a smaller scope cannot. You’ll love the field of field available at 31/10.5 for every 100 yards. It makes it possible to focus comfortably especially accompanied by the eyepiece. The adjustments are made easier by the truplex reticle and the audible 1/4MOA windage and elevation click values. This means you’ll never miss making a correct modification in target acquisition. The versatility of this scope extends on to the durability and robust build. It can withstand recoil as it is shock-proofed and fits well in the hunting environment. With the Simmons 8-Point point you are assured of longevity due to the waterproof casing that keeps the internal elements working in right condition. The glass optics is deemed never to fog making it easy when hunting in rainy, hot and humid environments. It does not come with the mounting rings. Related: Find your range fast with the Simmons Volt 600 801600 Laser Rangefinder. It can acquire range correctly for up to 600 yards. It bears a one-button operation and a fixed medium power of 4x. It carries an LCD and is compact enough not to add weight to your hunting gear. Description: The Bushnell Trophy 600 XLT DOA carves its way into the hunting world with utmost accuracy. Bushnell is a trusted brand so it assures you of high-quality optics that comes at a bargain. The scope carries high variable zooming options where the resolution is sustained at all power levels. It comes with the DOA 600 ballistic reticle that is known for producing dead-on accuracy out to 600 yards. With it, you can quickly acquire certain range on different distance levels, giving you the chance to have many possible accurate shots. This scope boasts 91% light transmission primarily because of the 40mm objective lens and the fully multicoated lenses. It keeps you in a fine view of the image and highly contrasted targets. You can then tell the background apart from the target enabling you to make aims on point. It comes with a fast focus eyepiece to adjust the reticle. If you’re in target shooting, this scope will work correctly because of this eyepiece. This scope will last a decent period in that it comes as a one piece unit for added strength. The scope’s parts fit seamless to prevent bumping and misaligning of the components; hence it can maintain the elements. It also comes with Butler Creek flip-up covers. These caps are essential for preventing dust and other debris from attaching to the glass surfaces. They are useful when you need to dim the light in dazzling, sunny days. It makes for a dependable scope in the harshest weather conditions. Lastly, this scope comes with an integrated saddle for quick mounting without tools. 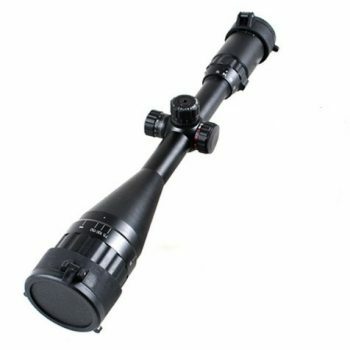 Description: The BSA Deer Hunter Riflescope represents one of the most sought deer hunting riflescopes on the market. In fact, it has been sold out severally on Amazon. It holds up to heavy usage experienced in today’s shooting environment. First, it features camera quality optics to enhance the viewing of targets on its fixed 2.5x zoom. With a little power, it means you gain a full field of view suitable for close range hunting. 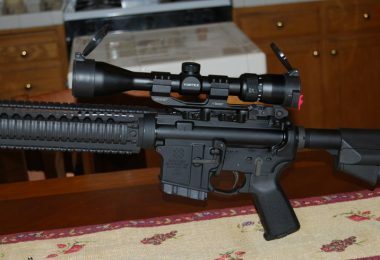 This scope keeps you alert in that you can focus on fast moving targets quickly and easy. You get to experience a compact and lightweight scope since it has a relatively small objective lens. However, it does not hinder the light gathering capacity as the optics quickly identifies the aim, bringing you clear and crisps images. Sighting in is uncomplicated as it carries simple hand turrets and it provides for ¼ MOA windage and elevation adjustments. It keeps you in line with making clean and precise kill shots. You can pick out targets when the area is hilly or windy since it assures correct modifications over what you see. This scope houses the components in a one-piece tube. It is of a short length of only 20mm and comes in handy when aiming far as it keeps the controls at easy reach. It allows parallax correction for every 100 yards and comes with a long exit pupil. The exit pupil is fundamental to persons who wear glasses to compensate for the long distance between the eye focus and their eyes. You will cease to feel like you are peering through a keyhole when focusing. It has a short eye relief that speaks more of its capacity to take recoil. You can rest easy when in rough terrain since BSA gets you covered. Related: We highly recommend the BSA Optics 5 Mode 140 Lumen LED Flashlight for fast target acquisition. This flashlight is essential since the reticle on this scope has no form of illumination. You can make it through dark environments as it has five functions so you can adjust the settings accordingly. Description: The Truglo Strut N Rut Compact is the perfect option for the big game, particularly deer hunting. It has a camo finish that lets you camouflage with vegetation when out in active shooting. You can safely track an animal close enough when you want to take a precise shot. This scope has a 4x fixed magnification. It makes it a short and medium range device regarding the full field of view you’ll be getting. You will be in the right gear whenever you want to make that perfect kill with the available focusing features. With the screw down caps, the scope allows fingertip windage and elevation adjustments. They are spring assisted making it ideal for correcting the settings just by feeling the position on the turrets. It is adorned with a fully coated lens to keep reflection at bay. They help in achieving clear images without the possibility of blurring in low lit environments. Reasonably, as a morning person, you can still take down that buck. Some users even love going further into the dark because this scope has bright animal impressions against dark environments. Truglo is known for setting the standard on durability and reliability. 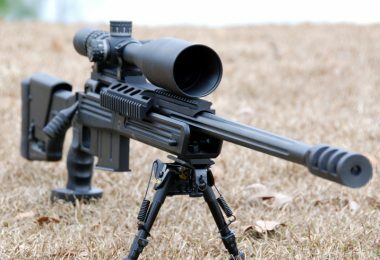 It is armed with an aircraft grade aluminum body which makes the scope highly shock-proofed. It can resist damage from impact and shifting of the set zero. It even has a rubber eye-guard for keeping you safe from metallic allergies. You’ll appreciate the diamond reticle that is perhaps the major attraction of this scope. It affords the highest probability of acquiring targets dead on with precision added to your possibilities. Related: You’ll highly benefit from the Truglo Weaver Rib Mounting Adapter. It will keep your scope securely on the gun while allowing the best height for clearing your view. If you use 3/8” bases, then this adapter will transform the base into a standard Weaver. You’ll gain from stability and protection from recoil. Description: The Vortex Optics Viper HS gets the job done effectively. The pricing is that of a high-end product which goes on to say you should expect total cooperation from this scope. It has a 44mm objective lens to make for the bright images showcased by the optics. You’ll like that you’ll no longer have to take time before figuring out which animal is in the distance. This level of alert is only experienced because it reveals great contrast of images making it possible for fast target acquisition. If you are an adept long-range shooter, this unit is specially designed for you. The zoom is versatile and extends all the way from 4xto16x. You will always get the imaging effect you deserve on all the zoom levels. It has a magview bar which sustains the bright quality of the images in low light. Complemented by uncapped high turrets, they make windage and elevation corrections effortless. The CRS (Customizable Rotation Stop) zero stop ensures that it keeps it from shifting. This way, you’ll successfully make repeatable shots ensuring that you don’t lose your target when they become aware of your presence. The one-piece 30mm tube is a major attraction because of active usage and storage purposes. You’ll never be in a position where you lose any installed parts since they all go seamlessly into each other. For you that loves images in their true natural colors, you’ll appreciate the XD glass with XR lens coatings. They not only enhance the color, but they also give you a high resolution for clarity and improve light transmission in low visibility surroundings. Related: You’ll want to include the Viper Optics Sunshade in your hunting accessories. It is crucial for reducing both reflection and glare so that you can maintain your position as well as keep your images within the correct contrast. It attaches easily to the 44mm objective lens like experienced by this scope. Also, get yourself the Vortex Optics Black Sure Fit Riflescope Cover. It will help preserve the life of the scope as it will keep it from the elements exposure. Description: The Ledsniper Aoe Riflescope is an impressive long range deer hunting scope. It comes with a multiple zoom system to keep your focus clear over long distances. With the red on green and blue illumination, this scope lets you hunt even after the light fades in poorly lit environments. 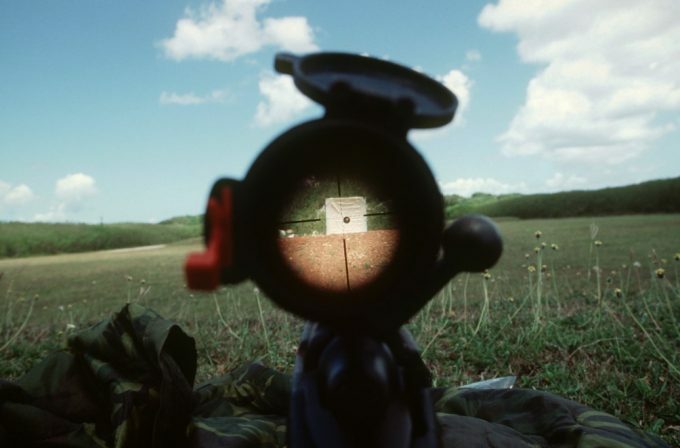 The red on green crosshairs are essential for acquiring the point of aim while the blue illumination makes figuring out the targets in the background while telling apart the physical features and general view of the elements. This aspect ensures you make correct windage and elevation adjustments when your target appears small against a fuzzy surrounding. Many users gravitate towards this scope because it comes with multiple accessories that would otherwise be bought separately. One, it has the flip-up cap lens to secure the lenses completely from the outdoor elements. They are aluminum made, ensuring they can afford proper service to your scope. It also comes with the required sunshade to eliminate stray light that could obstruct your view. Not forgetting that it also comes with the ring mounts to ensure that the scope mounts safely on the gun. For quick zeroing, the Ledsniper comes has very significant modifications including the 1/4MOA elevation and windage allowance. It comes in a short 25.4mm tube with 32mm on the objective lens. This combination allows high light gathering capacity for brighter images. It comes with a long exit pupil to enhance the clarity of the picture. It also features a short eye relief meant to bring your scope in line with the rifle. Expect to use this scope for many years thanks to the solid one-piece construction. Related: Get a replacement for your sunshade, with the Ledsniper 50mm Tube Shade Metal Tactical Tube Sunshade. It’s also best for the days when you encounter too much stray reflection. It is very inexpensive, is metallic and has an aluminum construction. It will be all worth when you actually see that poor animal drop. 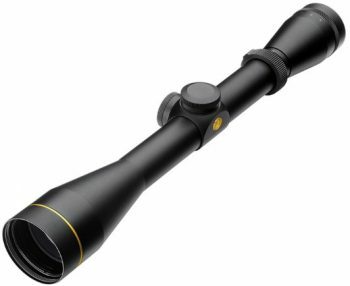 Description: The Leupold VX-2 Duplex Reticle Riflescope is the all-around hunting riflescope ideal for the active hunter. Every feature speaks reliability in the way it manages the harsh hunting environments. 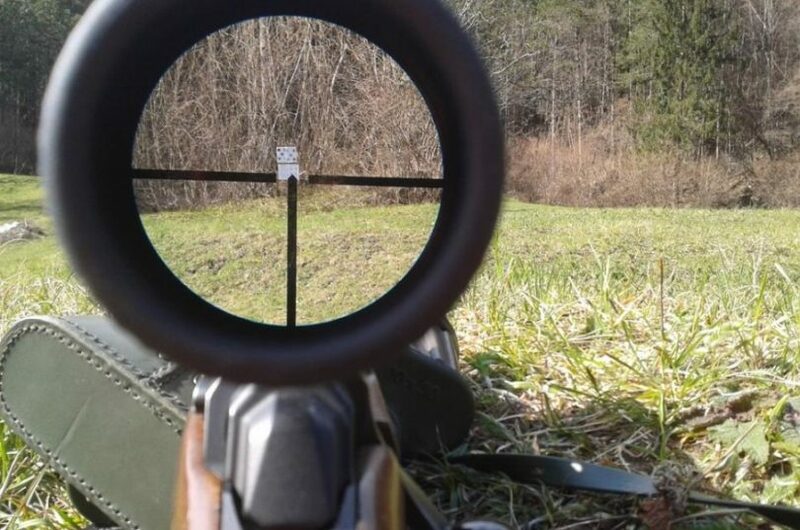 Nothing could go wrong when you have this scope on your rifle. 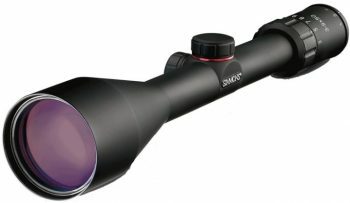 It has variable magnification to cover a wide area in close and mid range hunting. With the 40mm objective lens, this scope can easily acquire as much light as is needed for clear, bright images without adding on to the weight of this scope. To zero-in on your target, the scope affords you with quick ¼ MOA elevation and windage adjustments. It has sure-grip turrets for that time your hands are cold, wet or in gloves. This means changes because of new developments will always be on point. It carries seven crosshair patterns sitting on the second focal plane. This means you’ll not have to keep up with changes in reticle size as you modify the zoom levels. It enhances the probability of making the first shot to kill not just to injure the deer or worse still miss it. You’ll love working with the Leupold model since it has a short range of eye relief, allowing you to mount the scope nearer to the base so that it is safe from recurrent recoil. This also means you can reach out to the turrets without straining for fast corrections. The essence of this scope comes in the fact that it ensures you have the full convenience of working in harsh environments and with lots of dangerous ground to cover. The housing is sturdy for impact resistance, and it’s 100% water and fog proof. Related: There’s a useful Leupold RX-600i Black Rangefinder with DNA Engine. This unit helps in acquiring the correct range when it comes to making the first correct shot and for repeatable performance. You’ll like the solid build and the textured black finish. It is reasonably priced for a scope that provides quick measuring of range. Don’t forget to acquire the Leupold Std Matte Medium Rings. They keep the scope in proper clearing and the focus knobs out of contact with the base. They come in a rugged design and suit standard Weaver and Picatinny bases. As we have seen, picking out the right deer hunting riflescope is no walk in the park. You’ll want to meet your demands and specifications so that you are not disappointed on the field. We hope we have covered the details that will help you make the right decision on your next scope. Lastly, we’d love to hear from you. Do you have experience with any of these scopes? If so tell us about it in the comments section below.